Restorative + Hatha Yoga = A Different Kind of Class for a Different Kind of Yogi. Intrigued by that asana math? We were too, which is why we reached out to Shellini Spencer, the founder and creator of Kin Chi Yoga in Hazlet, NJ. Shellini is pioneering what we are calling a slow, deep release – the kin chi method of movement and meditation. 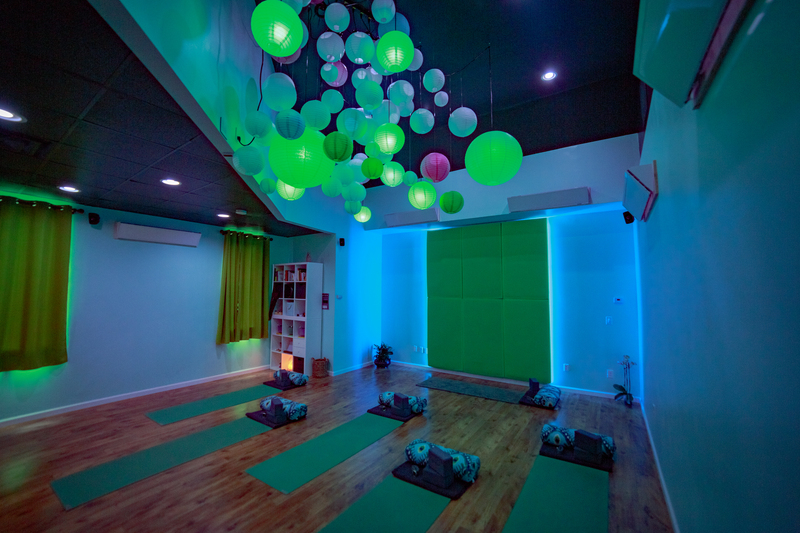 The NJYC HIGHLY recommends you check out Shellini’s studio and experience the nourishing, grounded sort of flow that she has so lovingly created. I was asked to explain why my and how my classes are different. I feel like my classes are a unique blend of hatha yoga and restorative yoga. I specially designed it to be that way. Why did I do this? As I was going through my own practice and advanced training to become a certified yoga instructor I fell in love with the benefits of the restorative aspect. I had my friend and mentor, Bridget, suggest to me that I should have a Restorative Yoga class every single night. As yoga teachers, it is out job to guide our students into deepening their practice. I felt like I had to ease people into it. I had to show them, it can be done, even though they might think differently. My goal is to take the intimidation out of yoga and to slow people down in an age where we move so fast, from one thing to the next. I want people to understand that everyone can do yoga. I did not feel like people would come to a fully restorative class every single night. I sat down and thought about things I loved and things I would have liked to see more of in my own personal practice. As I sat to think, I always have the voices in my head of all the people who have helped to influence me. There is a special part in my brain where they actively chatter. Listening to that, helps keep me grounded. All my classes are either 75-90 minutes long. I have no hour long classes, with the exception of the Family Yoga which is only 45 minutes with food-based donation admission. In our fast paced tech based world, even yoga classes have become something you do and then onto the next thing. That should not be the case. How can you possibly connect the mind, body and spirit in such a short time frame? An hour was not enough. I designed my classes into a format of taking the time to first detach from tech. We sit still to stop and learn to listen to our bodies. We breathe. 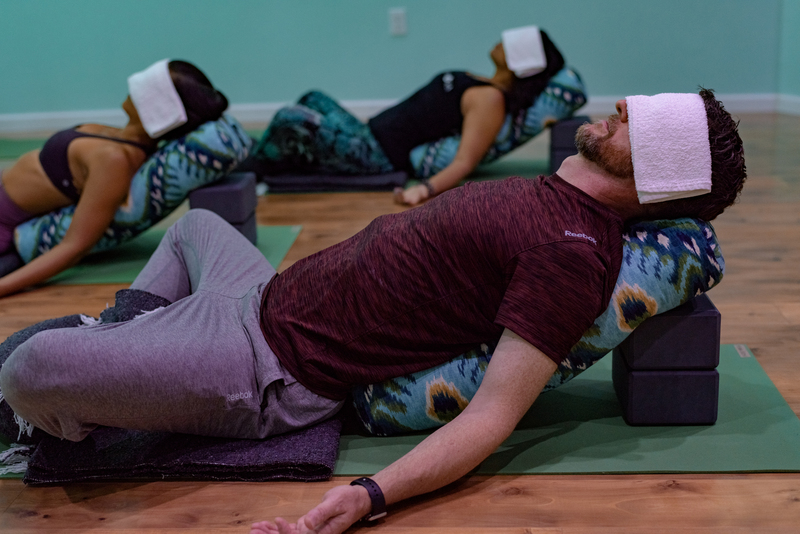 We go into 45 minutes of yoga and then the last 15-30 minutes (depending on the length of the class) we have savasana in restorative yoga nidra form. When you reawaken the body after class is over, hopefully you take the calm serene feeling with you into you day or evening. Now you have had a taste of the delicious appetizer for my Santosha Sunday, the main course which is a deep restorative yoga class. And now, you need to know a little bit more about the transformative woman behind this new-school of yoga (with all the best old school vibes). Shellini is the head yogini at Kin Chi. She practices being grateful daily for her awesome family and friends; she loves to laugh and have fun in life. Shellini believes in the healing abilities Yoga and Reiki has to offer, and endeavours to spread joy and calmness to every person she encounters. Her nourishing and caring style of teaching comes from the heart and a place of happiness and deep relaxation. Essentially, she is love personified. Seek her out, and get to know her.